Origami artists transform a single flat sheet of paper into graceful figures like swans, butterflies and flowers. Who knew the same could be done with a sheet of steel? 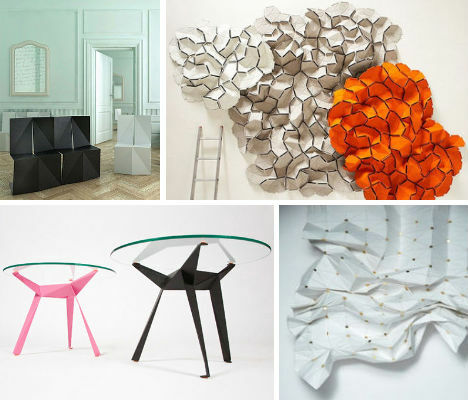 Furniture designers inspired by the simple elegance of this ancient art are creating incredibly beautiful and functional chairs, tables, sofas – even curtains, lamps and wall hangings – that transcend the ephemeral nature of paper sculpture, making it an integral element in the home. A single sheet of polypropylene plastic bends and folds to form a modern chair that can comfortably support the average adult despite a miniscule weight of just 11 pounds. 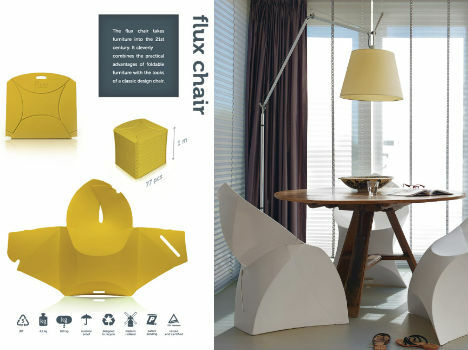 The Flux Chair folds flat and has a built-in handle for easy transport and takes just seconds to assemble. The clean and simple yet visually interesting design, light weight, wipeable surface and stackability give it great potential for low-cost lounging. Folding a thick sheet of steel is no easy task, but that’s exactly what engineers did to create the 4foldlow table by British designer George Rice for Formtank – by hand, no less. 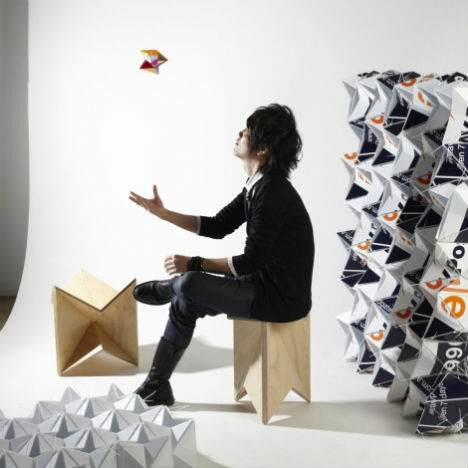 The Japanese origami-inspired design is laser-cut from a single sheet of steel to minimize waste. “The development of 4foldlow has been long and extensive, requiring complex mathematics and precision engineering. The outcome is visually complex, while on closer inspection the structure begins to reveal itself,” Formtank explains. It looks like a paper blossom, but this modern folding stool by designer Nina Bruun is made from plywood upholstered with foam and woolen felt for both sturdiness and comfort. Six pieces of plywood are assembled with hinges in this pretty flat-pack design. 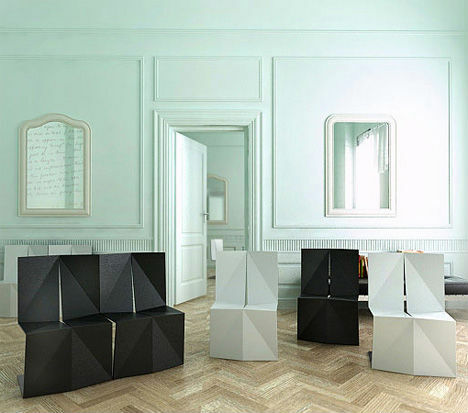 This fun leather sofa from Spacify really does look like it could be a miniature, made of folded paper. 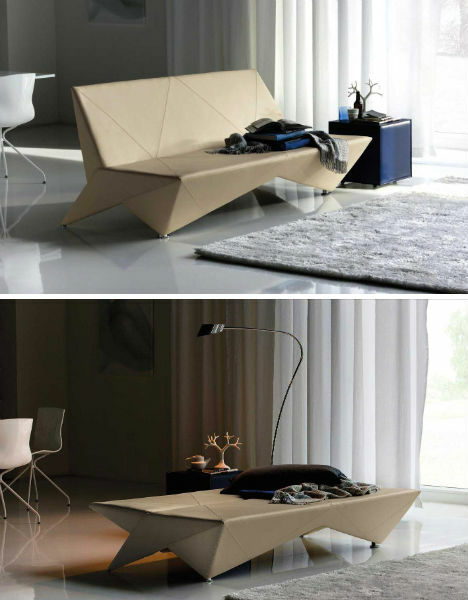 It’s actually a sofa bed in a sleek and simple shape with triangle-shaped leather-upholstered panels, folding out into a basic bench-like bed platform. Imagine carrying what looks like a basic tatami mat to the beach, unrolling it, popping a few supports into place and, boom, you’ve got a full-sized chaise lounge! German design firm Confused Direction created just that in the ‘Poissonmobile’. It’s now available in more colors through the designer’s website. 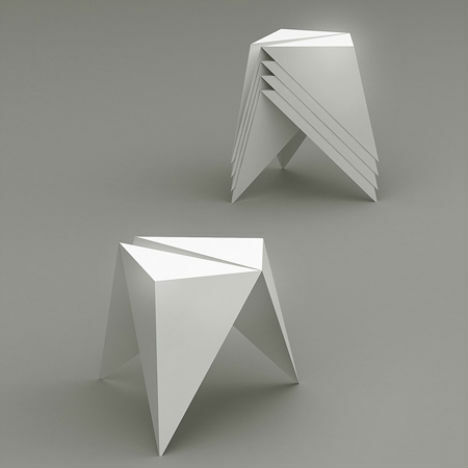 These incredible chairs by designers Enoc Armengol and Arnau Miquel even have a paper-like textured surface. They’re each made from a single sheet of stainless steel folded into a hook shape and accented with slightly folded angles. 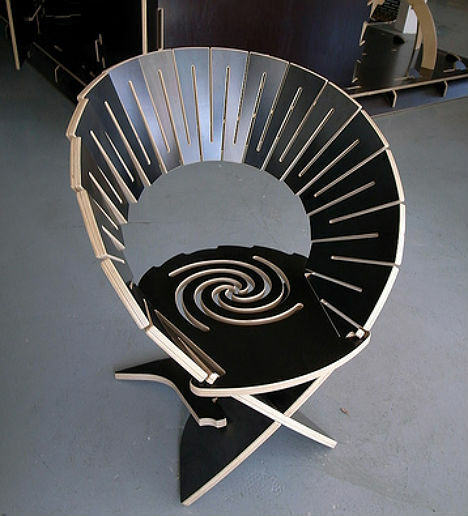 The chair is available in either black or white leather finish. 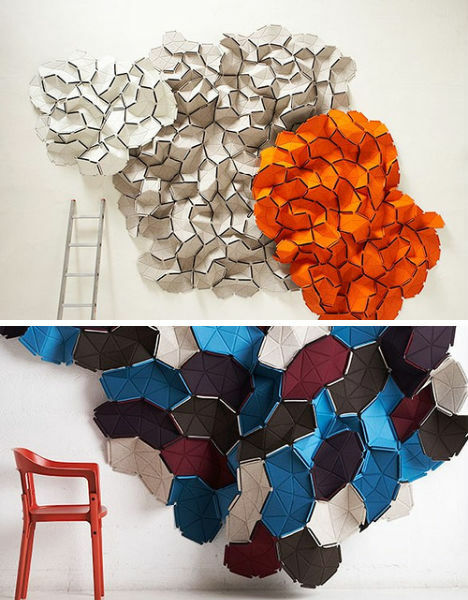 Turn origami into interactive wall décor with Clouds – modular textiles by Erwan and Ronan Bouroullec. Each little colored section of fabric can be connected to the next with a special type of rubber band, making it easy to create works of art for your home, whether you want to hang them up as a wall hanging, use them as a room divider or craft some kind of sculpture. 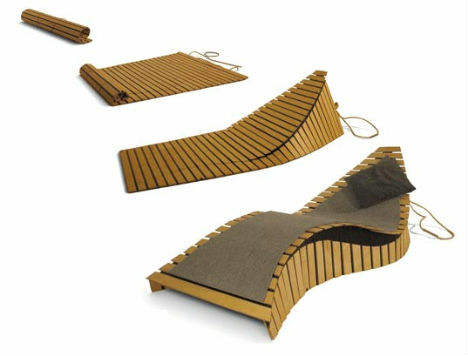 Designer and inventor Gregg Fleishman created this awesome folding chair out of a single board. Barely a scrap was wasted, and it definitely looks like it would be fun to assemble. 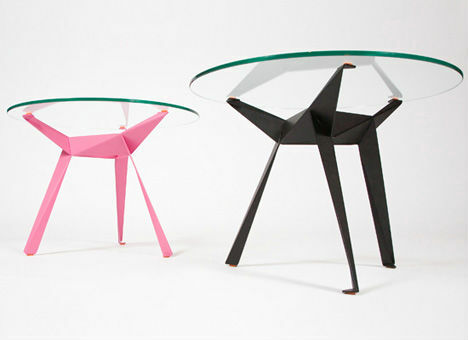 No glue or nails are required to assemble this fun flat-pack table base, which forms a rather insect-like tribot figure once the pieces are slotted together. 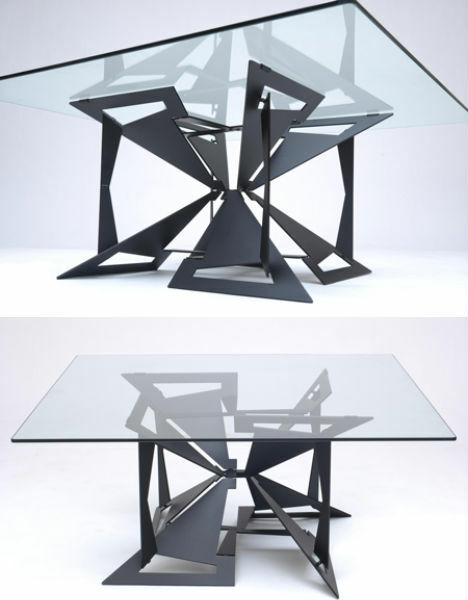 Designed by Anthony Dickens and Tony Wilson, the Origami Table actually gets stronger when you place a glass tabletop on it, because the weight causes the joints to tighten. 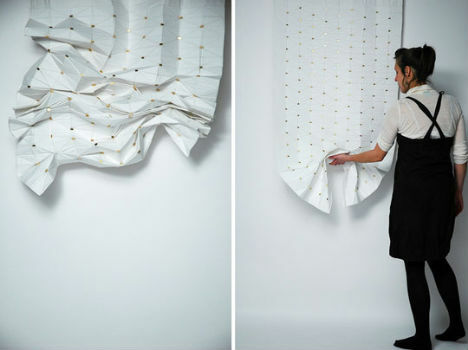 Magnets sewn into the fabric of this curtain/window shade by designer Florian Kräutli make it possible to easily move the curtain into practically endless shapes. It’s almost like having a constantly changing art exhibit as part of your home furnishings. 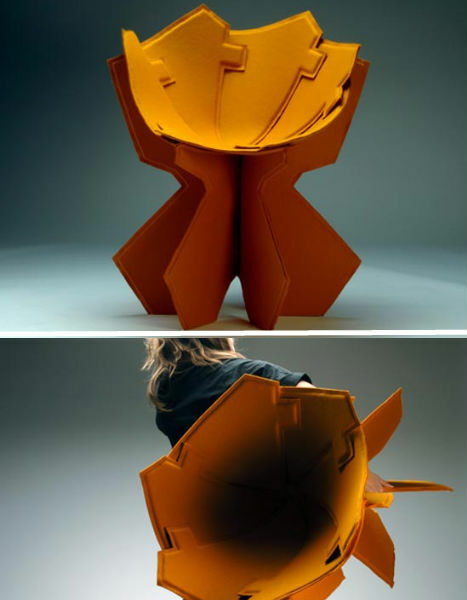 It’s just a concept, but the design would make any origami enthusiast eager to try out new designs. Designed by Christina Waterson, the Bloom Series includes a stool, a magazine rack and some more conventionally-sized origami ornaments. The simple stool is made from plywood in a shape reminiscent of an origami flower, while the magazine rack is crafted from recycled materials. 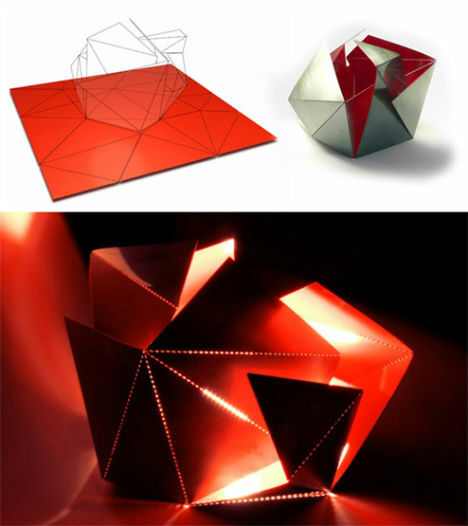 A sheet of stainless steel comes with pre-scored lines that, once folded, create an interesting geometric housing for a lamp. The ultimate shape of the lamp depends on the order in which you create your folds, giving you creative control over the result.